COLUMBIA, Mo. — In an effort to more closely integrate the University of Missouri Press with the academic and research missions of the University of Missouri System, UM President Tim Wolfe and MU Chancellor Brady Deaton announced today that a University of Missouri Press Advisory Committee is being formed to provide advice and counsel on the Press as it is transferred to MU. In addition, the UM System is transferring responsibility for the UM Press to the MU campus immediately. This will allow MU to work directly with the current Press operation and the Advisory Committee to create a Press that will be adaptive to the changing world of scholarly communication. The Advisory Committee will consist of representatives from the faculties of the four UM campuses, student scholars, external representatives with expertise in scholarly publishing, a representative from the Press Committee and authors. The Advisory Committee will work with the Press transition team composed of MU Chancellor Emeritus Richard Wallace, UM System Assistant Vice President Deborah Noble-Triplett, Wolfe and Deaton to ensure high-quality service for University of Missouri Press customers, authors and vendors while maintaining a focus on quality, collaboration and innovation. Work to ensure that the citizens of Missouri, the four campuses of the University of Missouri System and scholarship worldwide continue to be served by the University of Missouri Press and that the Press continue to publish important literary, scholarly, peer-reviewed books. Continue to publish and print books as the Press expands its already substantial list of digital editions and explore other opportunities presented by new media. Continue to pursue a high-quality, rigorous acquisitions process with subject matter experts and peer review. Focus on relationships with authors (backlist, front list and future), including strong marketing programs and editorial support. 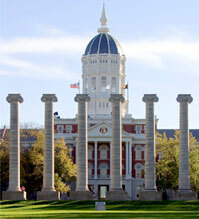 Integrate the Press with the academic and research missions of MU. As part of the transition, Dwight Browne will continue to serve as interim director of the Press reporting to MU Provost Brian Foster and will be part of the Transition Team. With advice and assistance from the Advisory Committee, high priority will be given to recruiting an experienced, highly respected editor-in-chief, who also will have a faculty role. Those staff members currently employed by the Press are being asked to continue in their present roles. The Press will continue operations as the publisher of high-quality academic publications, including books and digital publications subject to peer review and will maintain its backlist. Nominations for the advisory committee should be directed to: MU Chancellor’s Office, 105 Jesse Hall or UM System President’s Office, 321 University Hall.